Yggdrasil is one of the most wanted Norse mythology power signs. This amulet is often worn by people who need support and assistance of supreme powers. The tree was considered to unite worlds and deities of the worlds in the ancient legends. The Yggdrasil was presented as an ever green powerful oak tree accumulating knowledge and wisdom of ancestors. It gives power and passes knowledge to its owner. 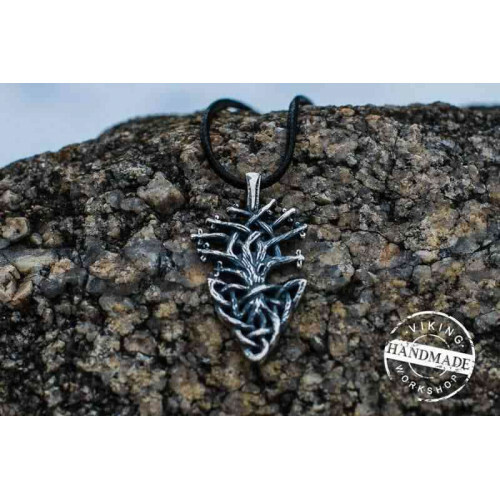 This is a charming representation of a symbol of the Tree of wisdom made of sterling silver. The pendant is manually crafted with great passion to details. Our masters do not use stamping for mass production of jewelry. Every item is made by order and is available also in gold version. The price depends on the metal type.